Great work! Maybe I could test it on this weekend (I need working phone on working days). Upload and I will give it a comprehensive try! This is so great, I hope you can get it stable enough for normal users. Good luck! are you planning on relaeasing the updated apps as well (as a stand-alone-dl, i mean)? EDIT: are you referring to these apps? absolutely no lags in using the phone. 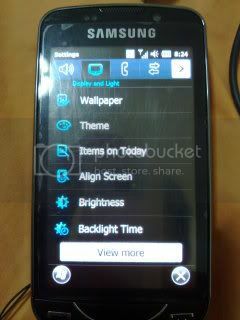 it has all of the stock rom stuff, touchwiz, widgets everything u get in the stock rom . check this one out. 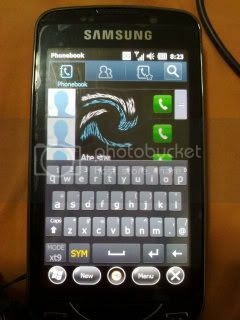 THE ONLY PROBLEM IS the default keyboard provided is so bad....it looks ugly....the rest works like a charm. here's the link. probably u can cook some custom rom with the samsung stuff intact. please consider using this and creating our own ROM. http://www.megaupload.com/?d=QXMWQPIP this is a rar inside which u will get .nb0 file. happy flashing !!! i am only providing the link. great thanks to the one who made it. Is the alignment problem fixed and scroll bar in dialer with this rom? What's it's build number? Free Memory? 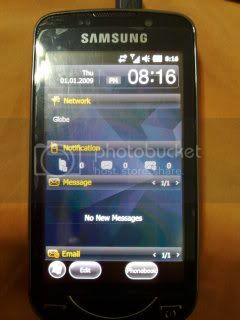 This ROM uses Samsung Settings from i8000 JD1, and unfortunately, they removed the x button option in Samsung Settings. Lets just hope, I could not quite understand how to get AmeBa to work. 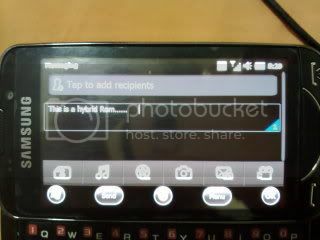 plus another reason i dont like 6.5.X is because all the buttons etc seem to be enlarged...what are they like in this rom? otherwise I would use 6.5.X but because of those two things i've stuck with 6.5. Enlarge buttons are necessary for the UI to be "finger friendly". 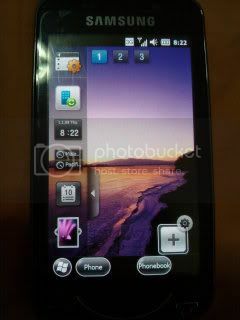 In 6.5.5 case, it is made more finger friendly (larger buttons) and fancier. I see, well i'll be sure to test the ROM out. Thank you daskalos for your efforts! Daskalos is this rom multilingual ? Greek language is included ? You are doing a great job !!! !